Chris Phelan watched the Home Run Derby, basically a glorified batting practice, and then the highlights. Bereft of box scores, he scoured the Web for trade rumors and midseason retrospectives, desperate for any scrap of news or analysis. He even caught some of Jon Lester’s no-hitter from May 2008, mercifully replayed in the absence of Red Sox action. All for naught. Three drawn-out days without his beloved Sox, and the toll was starting to show. With the Red Sox on a four-day furlough for the All-Star break, die-hard fans like Phelan, 25, floundered, fumbling about in a futile attempt to pass the time and endure a wrenching withdrawal. For fans who organize their days and much of their thoughts around the team, who feel out of sorts when the Sox are rained out or have an off day, the break has left a ragged faultline in their routines and sports-centered psyches. The midseason siesta is an annual aggravation for Sox addicts, but this year’s has cut to the quick. A soaked, sputtering start to summer had finally given way to real baseball weather, and it felt like the season was in full swing at last. Worse, the schedule-makers tacked on a day to the team’s respite. Without the Sox and baseball’s familiar comforts as ballast, many fans felt adrift. Sure, the All-Star Game has its charms, but in the most rabid enclaves of Red Sox Nation, some wonder whether it comes at too steep a cost. From April to October, the Sox are a reassuring presence for Janiak, 67. He and his wife watch every game on their big-screen TV, bought solely to follow the team’s fortunes in sparkling high-definition. But with no Kevin Youkilis or David Ortiz to occupy their evenings, programming like HGTV or “CSI’’ will be forced onto center stage. The mind, he said, reels. “A real downer,’’ he said. Clad in a 2007 championship T-shirt, he grimaced at the prospect. Many teams return to action Thursday, and some fans were dismayed to learn the Red Sox will not be among them. Like Marchand, 40, many fans planned to tune in to NESN’s rebroadcasts of noteworthy games through tomorrow, when the first place Sox begin the second half in Toronto. Others said they might toss in a coveted championship DVD. A few said they would use the opportunity to catch up on their reading. “I’ve been wanting to finish this book about the 1986 World Series,’’ said Mike Rumney, heading to the Freedom Trail with his 11-year-old son, Andrew, who agreed that four summer days without the Red Sox is a cruel blow. Worse, none of the other major sports are in action to fill the void, many said. “It’s not pretty,’’ said Stephen Kelley, a 35-year-old from Dorchester in a green mesh Sox jersey, cursing the bleak scenario. Replays, and a few drinks, will have to suffice, he said. “Plus I’ve got kids, so I can keep myself amused,’’ he said. Such preoccupation struck some fans as unhealthy. Anyone who truly struggled to fill their days without their favorite baseball team needed to take a hard look in the mirror, they said. Pink-hatted nonsense, others countered. Whether listening to the game on the front stoop or back porch, watching at sports bars with friends, or falling asleep to the call on the couch, fans blend the games into their lives, not the other way around. At Fenway Park yesterday, scores of fans from near and far toured the old yard. But after the tour, many were unsure what the evening would bring. “We have all these channels, but there’s nothing on,’’ said Michael Toohey, a 53-year-old from Salem, N.H., on vacation with his wife. “Just the Red Sox,’’ Charlene Toohey said wistfully. 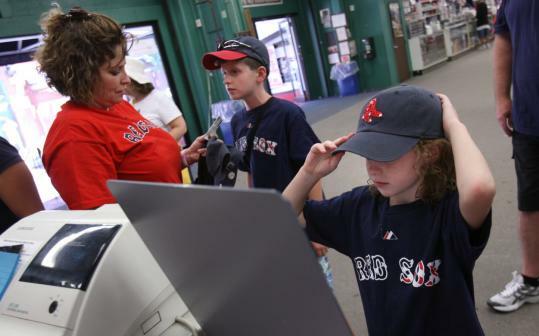 Across the street from Fenway Park, at the Red Sox team shop, the Kelley family scanned the Sox souvenirs. Danvers transplants living in Virginia, the Kelleys watch every game, and Spencer, 11, was counting down the hours until tomorrow’s first pitch. Still, he had a novel solution. “Playing,’’ he said, smiling.